United, still six points behind fourth-placed Manchester City, led when Mkhitaryan raced on to Ander Herrera's through ball and hammered into the roof of the net. Paul Pogba almost made it more comfortable for Jose Mourinho's side when he hit a free-kick against the post, but United ended a run of three games without a win in the league. The game ended in disappointment for Mkhitaryan, who was taken off on a stretcher with an ankle injury in the final 10 minutes at Old Trafford and has been ruled out until Boxing Day. Spurs missed the chance to replace Manchester City in fourth and remain fifth, three points above United. Are United finding their form? There had been a sense that Manchester United's performances were improving this season without the results - particularly in the league - following suit. But this was an assured display, coupled with a positive result, and will give Mourinho hope that his side can now build on a troubling run of three wins in 12 league games. A defeat would have proven extremely costly to United's hopes of claiming a Champions League spot and would have put them nine points behind the visitors. United were able to name the same starting line-up that drew 1-1 at Everton a week ago and that consistency appeared to give them the confidence to allow Spurs plenty of possession, without feeling threatened. Tottenham produced very little, despite their command of the ball, and it was United who were the more dangerous side through the counter-attacking pace of Anthony Martial, Herrera's neat passing and Mkhitaryan's link-up play. It was Herrera who created the goal, dispossessing Harry Kane in the middle of the park and releasing Mkhitaryan, while Pogba showed occasional signs of menace, forcing a fine save from Spurs keeper Hugo Lloris after curling a free-kick against the woodwork. It was all lined up to be the perfect afternoon for Mkhitaryan, who has turned around his fortunes at Old Trafford since joining from Borussia Dortmund in the summer. The 27-year-old, who became the first Armenian to score in the Premier League, had started only one league match in his first four months at the club. But Mourinho has brought him back into the fold and the result was two goals in as many games for the forward, following a strike in Thursday's Europa League win over Zorya. Mkhitaryan's revival may have been cruelly cut short, however, after he was carried off the pitch following a challenge by Danny Rose. Mourinho said the injury was not serious and expects him to be back for the Premier League match at home to Sunderland on Boxing Day. The Armenian's absence could open up a return to the side for Wayne Rooney, who was an unused substitute, while Marcus Rashford and Juan Mata could also be options. The only other negative for United was the booing from some supporters of Marouane Fellaini while the Belgium midfielder was warming up to come on as a stoppage-time substitute. Fellaini conceded the late penalty from which Everton equalised last week, moments after he had come off the bench. What went wrong for Spurs? It was a disappointing end to a positive week for Tottenham, who hammered Swansea 5-0 last weekend and beat CSKA Moscow 3-1 in the Champions League on Wednesday to secure a spot in the Europa League. The return of Toby Alderweireld to the defence, following an injury lay-off since October, would have only improved the mood of boss Mauricio Pochettino. But the goalscoring prowess and creativity of the last two games abandoned them as their laboured build-up play failed to put Kane into dangerous positions. United contained the visitors brilliantly, but Spurs lacked imagination and Wanyama's header from a Christian Eriksen free-kick, which the Kenyan put wide despite being completely unmarked, was as close as they came to scoring. Manchester United manager Jose Mourinho: "After so many matches playing well but not winning, we needed more the points than the performance. "But I knew against Tottenham it's difficult to get a result without playing well. But we played very well." Tottenham manager Mauricio Pochettino: "I think it was an even game, a really competitive game. A game that was difficult to play, always at Old Trafford. "We created some clear chances to score but I think they were more creative on goal and from that they scored and we didn't." How long since United have won a home league game? Manchester United earned their first Premier League win at Old Trafford since September, having drawn their last four in a row at home. Tottenham have lost back-to-back away Premier League games for the first time under Mauricio Pochettino, last doing so in March 2014 (a run of three). Spurs are winless in their last five away from home in the Premier League, their longest such run since April 2012 (a run of eight). Henrikh Mkhitaryan has been involved in four goals in his last four games for Manchester United in all competitions (two goals, two assists). Both sides will find out who they will face in the last 32 of the Europa League when the draw is made on Monday. 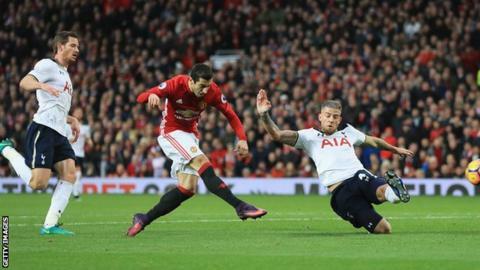 After that, Manchester United travel to Crystal Palace on Wednesday, while Tottenham host Hull City on the same day (both at 20:00 GMT). Michael Carrick (Manchester United) wins a free kick in the attacking half. Substitution, Manchester United. Eric Bailly replaces Henrikh Mkhitaryan because of an injury. Delay in match Henrikh Mkhitaryan (Manchester United) because of an injury. Attempt blocked. Antonio Valencia (Manchester United) right footed shot from outside the box is blocked. Assisted by Henrikh Mkhitaryan. Henrikh Mkhitaryan (Manchester United) is shown the yellow card for a bad foul.